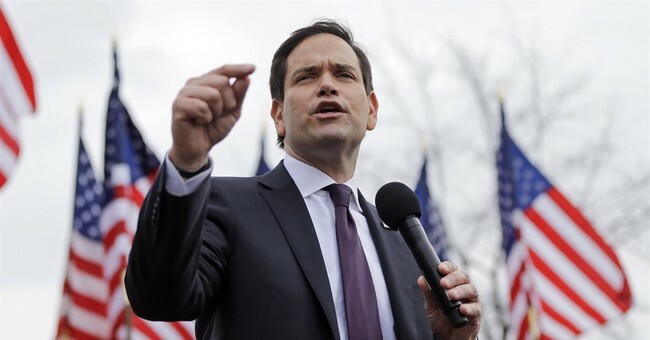 Rubio is the only one who can beat Hilary Clinton-we could lose the election. Hilary is a really liberal democrat, Bernie Sanders, a socialist, and Obama the worse President in history. Get real. Only Clinton, Sanders, and delusional democrats and socialists believe any democrat will win the 2016 presidential election. Any of our candidates with excellent communication skills, who are well versed on Hilary’s shady past or Bernie’s whacky past and ideas, would stand their own and win any debate. Without Marco, we could lose the Senate. That is a heavy load for this freshman senator from Florida. I hear he doesn’t even like being in the Senate. Perhaps many of the republicans in the Senate need to look in the mirror. If you were acting in bold ways to represent the people who sent you to Washington, and you were fulfilling your campaign promises, why would you need to worry about losing the Senate? Doesn’t matter if the democrats are in the majority or minority, they always seem to control the Senate. The energy and excitement seems to stem from the newer, younger, conservative members. We need more of them to shake things up. Some of you must be very tired-perhaps it is time to permanently return to the old homestead. While you are still there, you are being given one last chance to redeem yourselves. With the untimely death of Justice Scalia, you have a golden opportunity to prove your mettle and defeat Obama and the rascally democrats. Marco is the leader we need. All the candidates are leaders, and I know much more about their leadership than his. What is it that makes him the best leader for the job as President? I admire his serving as Speaker of the Florida House. I have some experience with House Speakers-it can be a tough job. His shared leadership with the Gang of Eight republicans and democrats, who advocated for amnesty and legalization for people in this country who broke our laws, to many of us demonstrated flawed leadership and judgement. Passing the legislation he advocated could have led to even more national insecurity and more democrat voters. Rubio is the expert on national security. Both Rubio and some of the establishment endorsing him make the claim that he is an expert on national security because of his committee assignment on the Senate Committee on Foreign Relations. What besides that fact deems him an expert on national security? Perhaps I expect more expertise from someone called an expert. With the Rubio reasoning, Ted Cruz would be an expert on the law because he serves on the Senate Committee on the Judiciary. Oh, wait a minute. Cruz is a lawyer, has practiced law, knows and understands the Constitution, and has actually appeared before the Supreme Court on multiple occasions. He definitely meets my definition of an expert. As a baby boomer, this election will be the most consequential in my lifetime. The United States of America created by the sweat and blood of our forefathers, and the Constitution and liberties it provides to all its citizens may completely dissolve from existence should the wrong candidate be elected President. Great damage has been done by the Obama administration and activist judges who haven’t followed the Constitution. There are two remaining viable republican candidates with complete understanding and love of the Constitution. Both, with a record of following the Constitution and accomplishing what they said they would. Their good hearts, intelligence, important accomplishments, and leadership and communication similarities with Ronald Reagan are not being recognized or appreciated. They have always walked the walk and fought the fight as conservatives and patriots. These candidates are ignored by the establishment and the media so willing to fawn over and publicize the two lesser qualified and knowledgeable candidates, Trump and Rubio. Will the bias of the media and the establishment lead to the election of Donald Trump or the coronation of Prince Marco? In the musical 1776, my favorite future President John Adams laments “ Is anybody there, does anybody care, does anybody see what I see?” Dear God I hope so!